I am glad to have participated in The Service Day 2015 on the 18th of March. As a new student in the field of service design and innovation it really made me open my eyes to how much service design has already spread into the health sector. I saw a lot of commonalities in the projects, which were presented. All of these projects included a great holistic view of the all the parts tied with the service and even better, an innovative fresh way of organizing them in a new customer centric and efficient way. This holistic view of customer insight was a part of all of the projects. What impressed me was how these projects really had people believing in them. In their minds there was little space for pessimism, a bit of sanity and a huge believe in the idea and a great deal of professionalism. What comes out when all these talented people with a different background are put in the same room, are these incredible service design projects. People need other people, and what all these projects had in common was an impressive amount of collaboration. Good service design is creating together. This is where I emphasize the word co-creation! The best sand castles are built with many hands and ideas. Children have the best imagination together, so why not adults? One raising castle is the new pediatric hospital, which has been largely discussed in the media and a lot of debate (e.g. 1a, 1b) has been going on about the funding of the project, which hasn’t followed the traditional norms of building public buildings. A foundation for building a new children’s public hospital was founded in 2012 and the hospital is going to be ready in 2017. Anne Berner had the first presentation in the Service Day 2015. As her presentation really impressed me, this blog post is devoted to her project. Among many other duties Anne Berner is the Chairman of the board of the Association and Foundation New Children’s hospital 2017. She pointed out that in the beginning of the project it wasn’t known who owns the project and who is in charge of it. She says that this was not easy as it wasn’t clear if it is the county of Helsinki or the state paying the bill. The solution was an open fundraising campaign, so that everyone anywhere could partake in the project. But … especially the media and part of the Finnish public seemed to think this was wrong. Happily not everyone. The funding is based on donations which some people think is begging. The way Anne Berner talked during the Service Day made me believe that this project is in the right hands. She has a humble and an iterative attitude towards the project which characterizes a good service design. She is very well aware of the critics and sees even the negative discussion around the hospital as positive. She takes critique in a constructive and strengthening way, which is necessary in service design. She also says that the more there is discussion, the more important the campaign becomes. According to her, best innovations are built only with criticism. Myself, I think this project is revolutionary and shakes the traditional thoughts of service into a new service design way of thinking. She pointed out that there has always been a lot of community effort in Finland, especially during and after the wars. Hospitals have been built using fundraisers before, so why should it be different now? It was decided in 2012 that the hospital should be finished in 2017, which according to Anne Berner would have been impossible without the help of all the necessary sectors involved. Normally getting a hospital up and running takes 10 to 20 years but in this project the goal was set to 5 years! Anne Berner explained that co-creation and crossing borders with the third sector, volunteer work, was an essential part of this project. A stakeholder map was surely done during this project. All stakeholders work for the same goal and the foundation took charge of the project. The project is built on equality and independency. Berner states that the diversity of funding sources gives freedom and independency to the project for it to go as fast as possible and to have less ties and barriers. Berner points out that there needs to be transparency in spreading the information and an attitude of making co-decisions. This makes the vision become possible! The hospital must achieve the best treatment outcomes. The functions must be made to support the child’s experience and comfort. Families with different types of situations must be taken into account. There are one time patients, chronically ill children and children with long and severe illness. The hospital must be a great place to work. The hospital must be efficient. The environment must generate a feeling of security. The hospital’s functions must work without any problems. The hospital must be planned in an energy-saving and a sustainable way. I can see that service design process and methods have been used here but unfortunately I didn’t have a chance to ask about it. It seems that service design methods such as personas, storytelling, customer journey mapping and service blueprints were used and at least service design methods have had a strong influence in the service design process of the new children’s hospital. According to Berner a common goal leads to a story of the new hospital and that these stories built the hospital. The main target customer group is the children and adolescents, and their needs are really thought through in this project. The processes, facilities, activities and the environment are seen from the eyes of a small child in pain and feeling uncomfortable. This customer insight, which I call in this case the “child sight”, is the leading idea in the project, and it goes hand in hand with the medical and professional needs of the hospital. Children, their parents, other members and staff were interviewed in the beginning of the project. According to the Helsingin Seutu (2) they also used quantitative surveys. The result was that the current “old” hospital from the year 1946, is considered to be friendly and professional but too small and old to serve its purpose. The building does not have clear division of functionalities and directions. Basic comforts don’t exist, for example where to wash teeth and where the sick child can rest while waiting. The time spent in queues is too long and why does the child go to the nurse and the nurse not to the child? 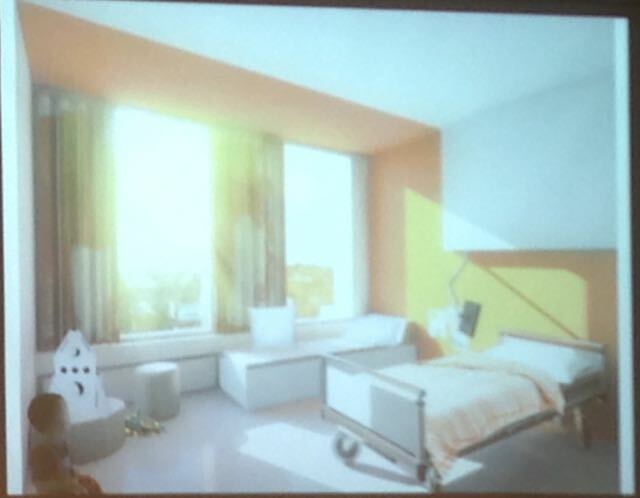 In the new hospital doctors and nurses can locate the child so that they can go to rest while waiting their own turn. A lot of service design thinking has gone into this project and old ways of doing are seen objectively. Things don’t have to be the way they are thought to be. I loved to hear how the emotional aspects are taken into account and how the environment is made easy for the child itself. Even the toilets and lavatories are built so that a small child can use them. Windows are installed to the level of the patient so they really see out. Colors are vivid, and the building is made to feel friendly and safe to be in. It is a playful environment with art and best technology, like robotics. Berner pointed out that it is really important that families can take care of their lives so that their routines won’t collapse. Parents need to be able to work and take care of other children even if they have a child treated in the hospital. Technological need such as a working internet connection needs to exist and there must be a place for the parents to rest. Berner also told about how children are able to attend online school during long hospital periods. She emphasized how important it is to take care of the child after the hospital period, to make sure that the quality of treatment is kept on a high level. The total project cost is estimated at around 160 million euros. 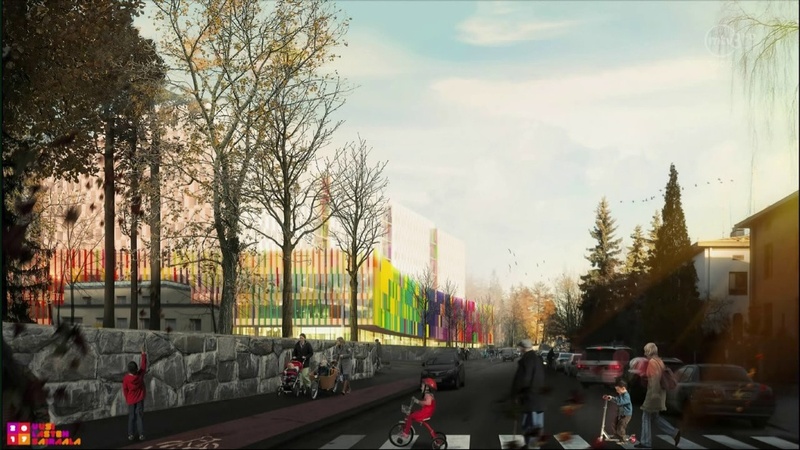 The Hospital District of Helsinki and Uusimaa are both going to invest 40 million euros to the project and the rest is covered by a 50-million euro loan. 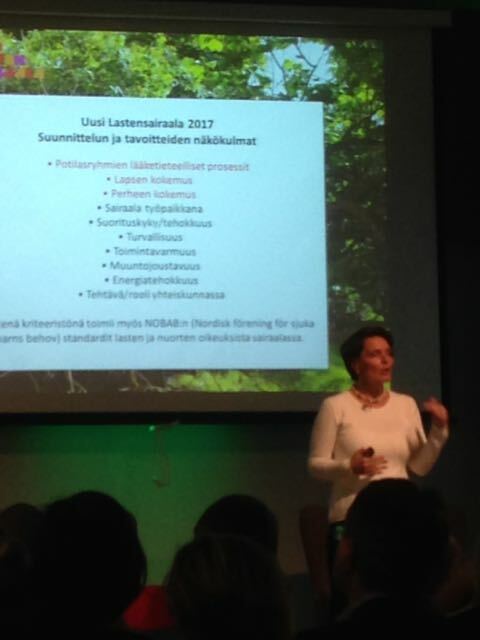 Tuulia Colliander, the fund-raising manager at New Children’s Hospital 2017, states in Helsinki Times that “It was an extremely positive surprise that Finns participated so widely” (3). Berner says that the total sum of donations is already 34 million euros which is more than she ever dared to dream of. This shows that community effort is still strong in Finland. Anne Berner takes her responsibility very seriously and feels that the people working in the campaign need to prove that they have kept their promise especially to the children, to the Finnish people, to the volunteers and to the donators. I was stunned of how much service design thinking there has been in this project and I also see that this project is a great example of good leadership! As a parent myself I am eager to see the results and happy that the best sand castle is going to become the best children’s hospital ever!